Here at Calendar Lady Promotions we have a large range of bugs that you can personalise with your company details and logo. 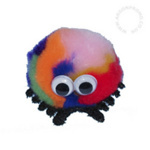 Our Standard logo bug is the original fun fluffy logo bug with a ribbon to carry your important message, company details or logo. So get advertised on our Standard logo bug today! Other promotional and personalised items besides our Standard logo bug click here. To find out more about our Standard logo bug click here and fill in the contact form and we'll get straight back to you.